Recently I pleaded with my readers (all 10 of them) to post some comments so I know that I'm being read. Thanks for your response! Blogging buddy Teresa (Terry) has responded admirably and leaves me many encouraging comments. Thus the title...Comment Terry on the Blog According to St. (???) David. You notice that I question my sainthood. Thanks to all of you for your comments and, Brodie, please spend your free time posting on your blog instead of commenting on mine. Just kidding. I've been way too hard on my buddy Brodie. Lizzie wants to hear from you though and so do your mom and dad and sister. 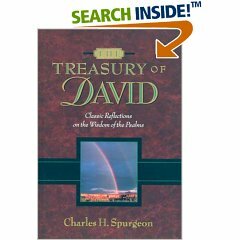 Author's Note: The pictured book, The Treasury of David, by Charles Haddon Spurgeon is an excellent commentary on all 150 of the Psalms. I'm in no way comparing my writing to Spurgeon's. I'm sure Terry would agree with me on this. She is a real fan of Spurgeon's writing and preaching. I don't think she was alive when he was though. Ha! Ha! This is so nice David!! PS..Yes, maybe Charles Sprugeon IS a little older than I am but he has always been my hero!! I will spend some free time on my blog - I was just checking yours out for some inspiration! Oh yeah, and I love that sandal story with your Mom!